1. The Google.com domain was registered on September 15, 1997. 2. Google gets over 100 billion searches monthly. 3. 40% of global web traffic dipped when Google suffered a 5 minute outage in Aug 2013. 4. “How to eat healthy” is the top health-related Google search term globally. 5. Number of Twitter pages indexed with Google is more than 6.2 billion. 6. 54,000 employees are working full time at Google. 7. Google Chrome has 1 billion active users. 8. 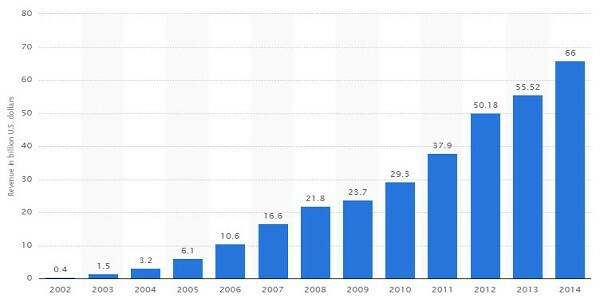 Gmail has 900 million users. 9. Gmail app has more than 2 billion android installations. 10. YouTube has 1 billion users. 11. 38.4% of YouTube video views are music videos. 12. More than half Google search is from mobile devices. 13. Number of monthly unique visitors to Google site was about 187 million in March 2014. 14. Google Analytics is used by somewhere between 30 million to 50 million websites worldwide. 15. Over 50 percent of business websites (both large and small) use Google Analytics.